"I'll say what I want. You got decisions to make about my life, you get on with it. It's got bugger all to do with me. I hate you for putting me in here." Alan Clarke made films that didn't compromise, with the majority of his output made for British television. Watching a film like Made in Britain, it's hard to believe it screening on the box in the UK; it would only be shown on pay cable here. It touched off some controversy in the UK, with its rampant swearing, drug use, and consistently anti-social behavior all coming in for censure. The trashy lowbrow Sun even did a count of the swear words to inflame its stolid readership. None of it matters now, though, as the film can be assessed in the privacy of one's home, with the airwaves safe from harm. Trevor (Tim Roth) is a sixteen-year-old neo-Nazi skinhead, repeatedly caught for a range of small-time crimes, his latest being vandalism against a Pakistani man's home. He finds himself sent to a halfway house for teens, where he's to be assessed before further action is taken. He continues his anti-social ways, taking every opportunity to strike out against the powers that be, despite their attempts to convince him to straighten out. The film follows Trevor's path as he refuses to give in to their efforts. As a lead character, Trevor is truly repellent; he really is a worthless piece of garbage. He is clearly intelligent, but he's also racist, violent, abusive, and generally an ugly human being. But Clarke refuses to judge him, playing him off of the representatives of a system that simply can't cope with him, and have no answers for his accusations of being phony sellouts who can't or won't question authority. Trevor, with his racist ideology, is automatically a unsympathetic character, but his actions indicate a more ambiguous nature; upon first arriving at the home, he picks up Errol (Terry Richards), a black kid stuck in the home waiting for his own assessment to come through. Errol tags along with Trevor through several misadventures, and for his apparent racism, I felt Trevor treated him as he would any other outsider who tagged along with him. His eventual dumping of Trevor comes off as much the same, rather than a racially-motivated action. The most disturbing part of the pair's activities comes when Trevor goes to vandalize the same Pakistani home he did earlier�the viewers see Errol join in the racist abuse Trevor yells out, abuse directed at Errol as much as the Pakistanis. Errol has been so marginalized by the system that he prefers supporting someone who hates him than the alternative of belonging nowhere. The film's centerpiece is a scorching encounter between Trevor and the men in charge of the halfway house. Having been thrown in the equivalent of solitary for assaulting the house cook, Trevor is subjected to a lecture detailing his path to prison, a fate he relishes. But when the gloves come off, Trevor and the social workers engage in a furious argument about each side's motivations and honesty. It clearly indicates the intelligence at work within Trevor, and further underlines the hopelessness of trying to deal with him as if he were any common juvenile delinquent. Neither side comes off looking more sympathetic than the other, and nothing is solved. The performances at the heart of the film make it what it is. Roth is absolutely astonishing as Trevor, perfectly judging every sneer and verbal attack. The rest of the cast are excellent as well, with Bill Stewart, Eric Richard, and Geoffrey Hutchings all superb as representatives of the system. Clarke's method of shooting with a handheld camera gives the film the edgy energy it clearly thrives on, and makes for a decidely uncomfortable experience at times. Image Transfer Review: Image quality is fairly grainy and soft, which, given the 16mm origins of the film, isn't too surprising. The transfer itself is perfectly fine, doing the best it can with the materials at hand. Audio Transfer Review: Basic mono is the only option, and like the image quality, isn't especially sharp, but it does the job, as the vast majority of the film is strictly dialogue based. Extras Review: Some worthwhile material is on hand for the interested viewer. Of primary note are two commentary tracks, one with star Tim Roth, and the other with writer David Leland and producer Margaret Matheson. The track with Roth also includes David Gregory of Blue Underground as a prompter and interviewer, and despite the occasional lulls, features a good mix of general comments about Clarke and the making of the film. The latter goes into more detail about the writing of the script, background information, and the reaction to the film by the public at large. Both are certainly worth a listen. Also included is a brief gallery of photos and the British DVD covers. A wickedly engaging film, Made in Britain poses questions that remain just as relevant today, even if the names and faces have changed. 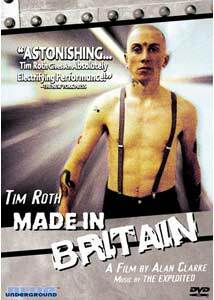 A stunner of a performance from a young Tim Roth anchors this tale of a young skinhead raging against the society he feels has sold out, and the system that is gearered up to roll over him. Blue Underground's DVD has two fine commentaries to add to an already first-class film.